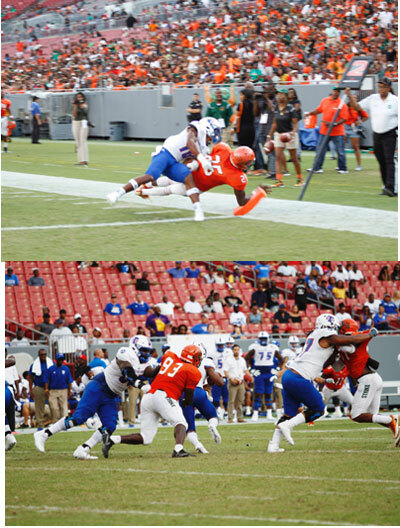 FAMU’s Devin Bowers (25) beats TSU defender Dajour Nesbeth to the pylon for a FAMU touchdown. 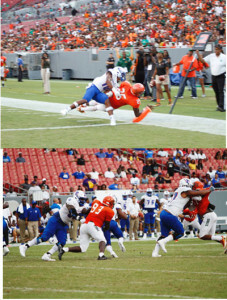 The FAMU Rattlers took on the Tennessee State Tigers at Raymond James Stadium in Tampa Bay. The Tigers won 24-13. The Rattlers are now 1-2 as they did not have any answers for the Tigers on offense or defense. Their defense was pushed around, and their offense was stagnant.